Municipal authorities have plans to take away more public space along Besiktas' public shore. Citing security concerns, plans for a major hotel are underway. 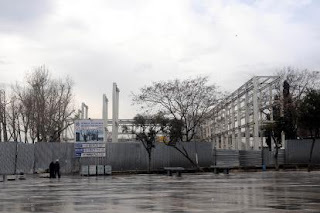 The Hurriyet Daily News has the story in English, which raises important questions about public space, privatization, and cultural preservation, all issues Istanbulu have had to deal with for some time now. One of the things I noticed in Turkey, and even in Istanbul, is the seeming lack of public space found in many other European cities I have visited. It seems the deficit might only increase, and much to Istanbul's loss.